Wanting to have a greener home and lifestyle is one thing; knowing how to make your home greener is another. In our previous post, we talked about the definition of a green home. Now let’s explore the specific things you can do to create a green home. The easiest way to regulate your heating and cooling is to install a programmable thermostat. You can input the times for heat or air to come on and off, or raise and lower the temperature, as when you are away or asleep. Set your appliances like your refrigerator to the optimal temperatures for cooling. Make your home greener by lowering the temperature on your water heater. Open the curtains and let the sun heat rooms in the cooler months. Check around doors and windows for air leaks and apply weatherstripping and caulk. Insulate within walls and in attics, basements and crawl spaces. This will keep your HVAC system from having to work overtime to maintain a steady interior temperature, and reduce drafts. Get rid of the old light bulbs and switch them out for energy-efficient CFL (compact fluorescent lamps) and LED (light-emitting diode) versions. These do not emit heat and will save money on electric bills over time. Make your home greener by turning off the lights when not in use. Even when electronic devices aren’t on, they still pull power. Those with lights, such as your TV and control box, computers and sound systems, and even your phone charger, can use almost as much energy in standby mode as when they are in use. Unplug them when you’re not using them. Instead of letting the water run when you brush your teeth or wash dishes, turn it off. Make your home greener by changing faucets and showerheads to low-flow versions, and taking shorter showers. Choose native vegetation outside your home and collect rainwater for irrigation or let nature support the native plants. Wash clothes in cold water and air dry them. When you send your food scraps and food waste to the landfill, as it breaks down it creates toxic methane, a greenhouse gas. Compost scraps like vegetables, eggshells and coffee grounds and (not meat) in a composting bin to use for your kitchen garden. Consider installing solar panels for electricity, heating and lighting, or utilize an optional ‘green power’ service from your power company. Look for the recycled symbol on product labels, and recycle what you can back out. Look for ways to recycle cardboard, clothing, old electronics and appliances, newspapers and books, for example. Don’t smoke or use aerosol products within the home, and grow plants that serve as natural air filters. According to WebMD, “Some plants are particularly effective absorbers of harmful pollutants emitted from carpets, furniture and electronic equipment, like spider plants, Boston ferns, rubber plants and palm trees.” Monitor your indoor air quality with a carbon monoxide detector and periodic radon checks. Make your home greener by shunning harsh cleaning chemicals. Either choose non-toxic organic options or make your own cleaners. Baking soda and vinegar are wonderful cleaning products. You may not need to use cleaners at all; simply wipe down surfaces with microfiber cloths that will pick up dust and dirt. Why pay a premium for fresh produce when you can easily grow it at home? Use your homemade compost to fertilize and avoid chemical fertilizers and pesticides. Water early in the morning to preserve water. 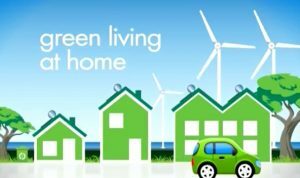 Först Consulting Group wants to do its bit in protecting our environment, and our area homeowners make their homes greener. Check out our range of homeowner services, from consulting on building a green (or other) home, home testing and home defect inspections, and estate management. Contact us today.